Good news! There may be a tinea versicolor natural treatment to tame the light or dark discoloring caused by a fungal skin infection. Whether these patches are present on your arms or legs, torso or back, they may cause you to withdraw from social activities in discomfort and embarrassment. Tinea versicolor is an ordinary condition that usually lasts only as long as the natural fungal yeast of the skin exists in abnormal amounts. We will discover home remedies to eliminate the excess yeast and which common household products can be used for tinea versicolor treatment. Known as pityriasis versicolor in certain medical circles, this infection is mainly caused by the fungus Malassezia globosa, with some cases by the Malassezia furfur fungi. The small patches of skin discoloration can be white, beige, light brown, dark brown, and sometimes a pink hue. It is normal to have a certain amount of yeast in our skin. Tinea versicolor is present when the amount increases and blotches of different skin tone appear. This is seen in humid, tropical climates; in people with weakened immune systems, and in those with excess oily skin. Although tinea versicolor is not contagious, the condition may cause the affected area to become itchy or irritated. Let’s now turn to popular options for natural treatment for tinea versicolor. 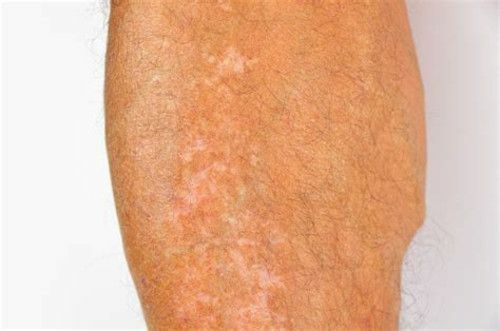 Try one or more of the following suggestions to lessen the appearance of, and possibly cure, the rash caused by the tinea versicolor skin condition. These are also intended to restore the skin’s natural look. Maintain a healthy and well-balanced diet to treat the infection and help prevent future outbreaks. A weakened immune system can lead to the breakdown of the health of the skin such as in the case of tinea versicolor. Consume foods high in vitamins A, B, C, and E. Incorporate yogurt and kefir into your daily diet, as well as other probiotics. Eat fresh fruits and vegetables and have an adequate amount of water daily to flush out toxins. Excessive yeast production can be caused by consuming too many carbohydrates. A common tinea versicolor natural cure is the powerful anti-fungal component of tea tree oil. Use this to combat any symptoms of itchiness while preventing the infection from spreading and possibly reoccurring. Mix several drops of the tea tree oil and one tablespoon of coconut oil or olive oil. Apply the solution with a cotton ball or swab directly onto the affected area. Once it dries, rinse and use a clean towel to pat dry. Repeat twice daily for two weeks. The fatty acids of a medium-chain variety found in the extra-virgin style of coconut oil work against the fungal infection. Place the coconut oil on the tinea versicolor rash and allow to dry. Rinse after 15 to 20 minutes. You may also want to mix one tablespoon of the coconut oil with five to six drops of cinnamon oil and follow the same method. Repeat either treatment two to three times each day until results are achieved. One of the best natural ways to treat tinea versicolor is by using aloe vera. Its anti-inflammatory and anti-fungal components may hinder the powers of the fungal infection. Aloe vera could also be used to heal the damage done to the skin. Apply fresh aloe vera gel to the tinea versicolor region three times each day for two months. You can also add three drops of lavender oil to one teaspoon of the gel. Any irritation, itchiness, and pain associated with a tinea versicolor outbreak may be cured with the use of oregano essential oil. It also could help combat the infection. Mix equal amounts of oregano essential oil and extra-virgin olive oil and apply to the skin with a cotton ball or swab. After a 30-minute treatment, rinse and repeat daily for three weeks. Turmeric has anti-fungal, antibiotic, and antiseptic properties to fight infection and speed up the healing process. It may also help to prevent tinea versicolor from spreading and returning. Fill a jug with water and add three to four teaspoons of raw unprocessed turmeric juice. Mix well and apply to skin after a shower or bath. You can also make a paste to apply directly on the skin by combining equal parts turmeric powder and sandalwood powder with a bit of water. A natural herb known as Indian lilac, or neem, has anti-fungal, antiseptic, and antimicrobial properties. Use it to decrease healing time as it may stop the growth of the infection. Boil Indian lilac leaves in two cups of water. After a 10-minute boil, strain water and, once cooled, rinse the tinea versicolor patches with the water. Repeat two to three times daily for three weeks. You can also grind fresh Indian lilac leaves and add water to make a paste. Apply to the affected area and rinse once the paste is dried. Use a carrier oil such as coconut oil or olive oil to mix with Indian lilac oil for another natural treatment. Repeat this process twice a day for two to three weeks. Aside from being a tasty food additive, apple cider vinegar has powerful antimicrobial components to treat infections and to stop them from recurring. Mix apple cider vinegar and water of equal parts into a healing solution. Use a cotton ball or swab to apply directly onto the spots. Rinse after 15 minutes and repeat daily for three weeks. You can also ingest the apple cider vinegar by diffusing two tablespoons in a glass of water. Drink this daily for three weeks. Baking soda is used internally to balance the pH levels, and could remove any dead skin cells externally on the affected area. Allow the baking soda to remain on blotches of tinea versicolor for 10 minutes before a shower or bath. Use a cleansing brush or exfoliator to gently remove the baking soda. Repeat daily until results are obtained. Plain yogurt has powerful probiotics to treat tinea versicolor. Enjoy at least two to three cups of plain, unsweetened yogurt every day. You can also use it as a skin mask by applying directly on the affected area for 20 to 30 minutes before rinsing. Garlic has anti-fungal components to combat the underlying cause of a tinea versicolor skin condition. It may also alleviate any itchiness. Use it directly on the patches as fresh garlic juice or garlic oil. It is best to allow it to soak into the skin for 20 minutes before taking your daily shower. Continue this for three weeks. If you enjoy the taste of garlic, you can chew on two to three garlic cloves or eat pieces on an empty stomach followed by a glass of warm water. Tinea versicolor is a noticeable skin condition, as it presents blotches of white, brown, or pink discoloration on the extremities or torso. Most cases present with no other symptoms, with others giving an itchy sensation and possibly pain. Despite the appearance, it is not a contagious skin disorder and may be treated with natural home remedies. The underlying cause of a fungal infection is also treated with treatment of the appearance of the skin. “Tinea Versicolor,” American Academy of Dermatology; https://www.aad.org/public/diseases/color-problems/tinea-versicolor, last accessed July 31, 2017.